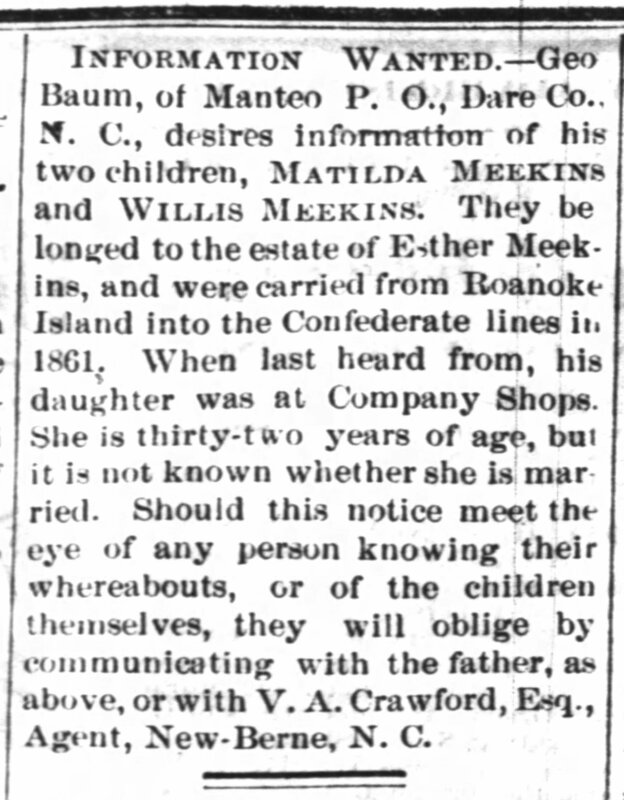 INFORMATION WANTED.—Geo Baum, of Manteo P. O., Dare Co., N. C., desires information of his two children, MATILDA MEEKINS and WILLIS MEEKINS. They be longed to the estate of Esther Meek-ins, and were carried from Roanoke Island into the Confederate lines in 1861. When last heard from, his daughter was at Company Shops. She is thirty-two years of age, but it is not known whether she is mar ried. Should this notice meet the eye of any person knowing their whereabouts, or of the children themselves, they will oblige by communicating with the father, as above, or with V. A. Crawford, Esq., Agent, New-Berne, N. C.